Electrify has just launched in Singapore, and they’re promising to help users save 20% or more against the Singapore Power Tariff. What the service does is serve as an online marketplace where users can shop power service providers and purchase “tailor- made plans, including bundled deals and electricity plans powered by sustainable energy sources”. This startup was launched just 2 weeks ago, and already the team says that they have signed up “a few hundred unique accounts created by various business users”. Singapore is heading into a future of liberalisation by the second half of 2018. What this means is that Singapore Power would no longer be the sole provider. All 1.3 million households and 200,000 business units in Singapore would be able to buy electricity from the 25 licensed third-parties in Singapore. This would in turn drive competition – a move that signifies more competitive prices and better electricity packages. 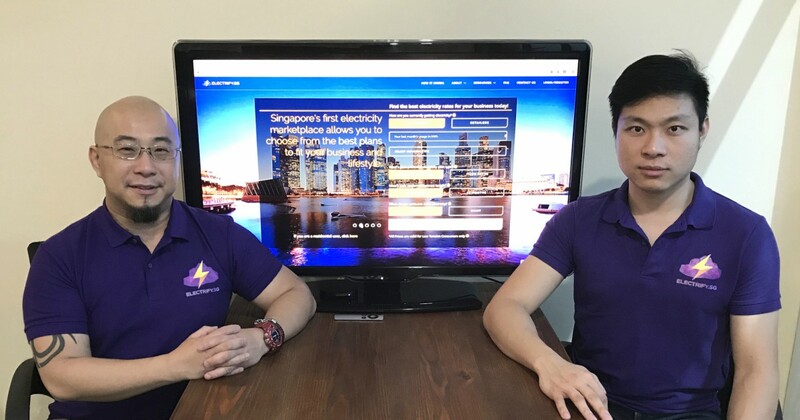 And so Julius Tan and Martin Lim decided to grab the first-mover advantage by starting up Electrify.sg. With years of experience between them of Tan working in the Sunseap Group and Solar Energy Research Institute of Singapore (SERIS), and Lim with multiple SMEs and MNCs in business development and planning, the pair is well-equipped to break into helping the businesses in Singapore propel themselves forward. “With 25 retailers there is confusion over price plans, misinformation and ambiguity about electricity liberalisation,” CEO Tan had shared. “We simplify the purchasing process,” he says, which can help businesses save time and effort while bringing better options to them at the same time. “Through our partners, we offer energy efficiency, demand management and even solar PV solutions,” he added. Right now, Electrify is only open to businesses, but by the July 2018, everything will change for domestic users as well. “A new user buying a plan from ELECTRIFY can expect a discount of 10%-30% against the SP tariff. With our launch promotions, users also enjoy additional benefits like $100 grocery vouchers for the 1st 200 customers and cash rebates”. They might only be 2 weeks old, but the pair already has plans to break into other markets – globally. The core obstacle is adapting themselves to not just the algorithms, but ensuring their business processes are “compliant with the new [target] environment”. For example, some countries pre-pay their electricity bills, while others make mobile payments to the local operators. This in turn could serve a a monopoly in that country, they claim. “For the first time, we are going to have every household able to choose the kind of power they want to buy, at the rate they want to buy and how they want to buy it,” Lim said. You can visit the Electrify.sg website to see how they can help your business.